The idea of Hawaii as a wine producer may seem far-fetched. But Hawaii’s wealth of climatic zones means this tropical paradise has opportunities to create decent, even good wine. Maui Wine offers delicious wines made from Pineapple, as well as up and coming estate grape wines. Faithful readers, please forgive me for my lack of posts of late. My job has offered great opportunities to travel and collect some very blog worthy food and wine adventures, but it leaves me virtually no time to write them. So here I am writing this post on a rare flight with no WiFi to distract workaholic me! On my recent (ok not so recent as I get around to posting this, and the trip itself was sadly quick!) trip to Hawaii, I needed to quickly learn the island of Maui to prepare for an upcoming event. 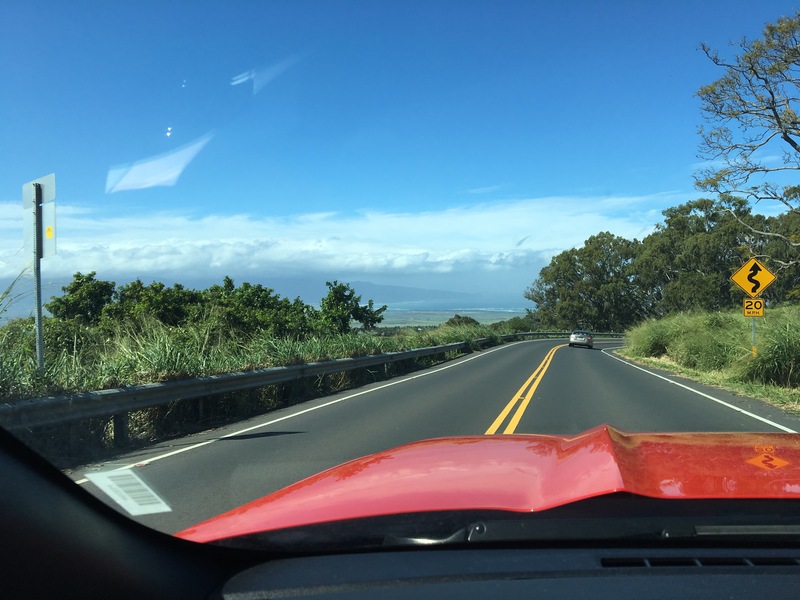 Having found myself driving around the scenic island in a bright red Ford Mustang, I made a slight detour to the slopes of Haleakala, a cratered volcano, and on it, to Maui Wine’s winery and tasting room. The drive was absolutely stunning, offering views of nearly 2/3 of the island. After a flight from O’ahu and this drive, it also was time to stretch my legs and try some wine. The tasting room is in a converted, whitewashed cottage surrounded by large deciduous and palm trees. 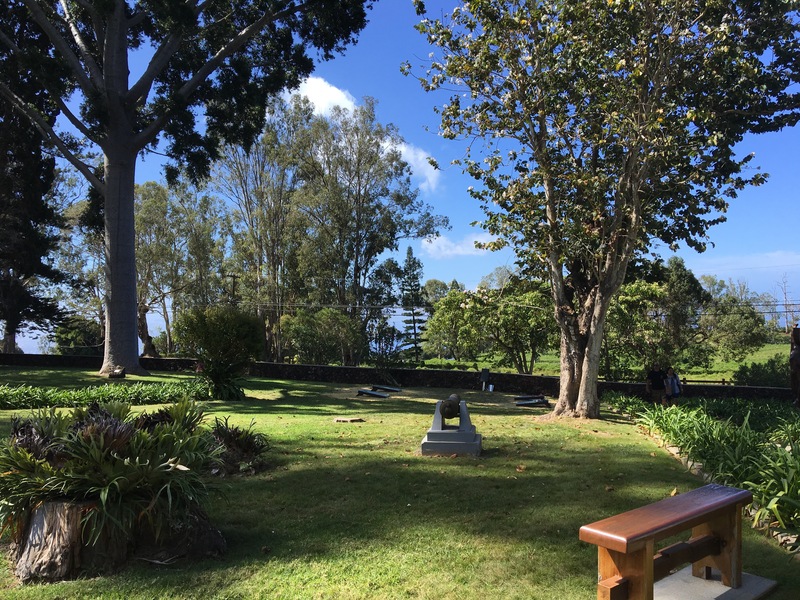 The manicured grounds and picket fences of surrounding Rose Ranch are a reminder of Hawai’i’s colonial, sugar plantation-filled past. The tasting room itself offers a glimpse into the ranch’s past, as well as the lengthy history of winemaking in Maui. 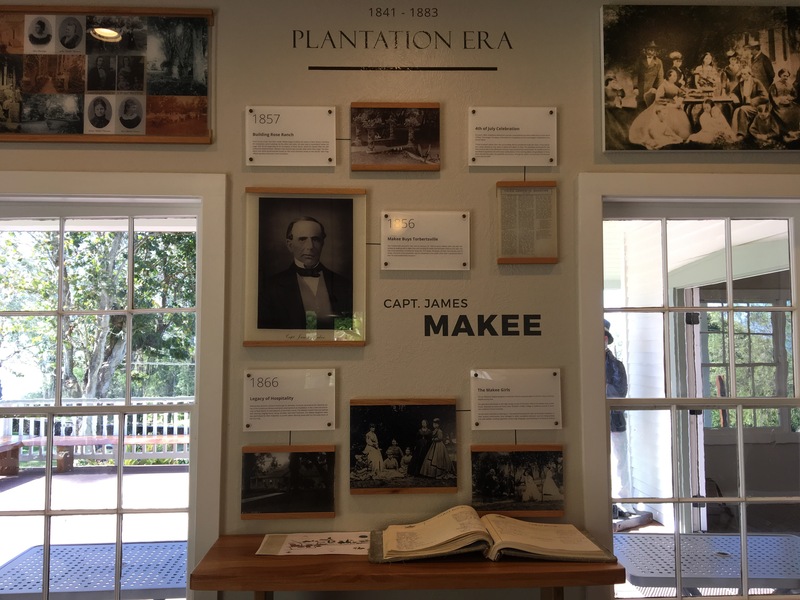 The ancestor of Maui Wines, which has changed ownership and branding several times, began winemaking in the late 19th century. Pineapple wines are the winery’s most produced and most popular. It’s easy to understand why. Its dry, sparkling Hula O Hawai’i pineapple wine is made in the traditional (champenoise) method. It is a perfect aperitif for a home gathering. The semi-dry Maui Blanc still wine was my favorite. It was full of complex aromas and an almost floral fruitiness. The sweet pineapple Maui Splash wine was smooth and drinkable, not as heavy or sticky sweet as dessert wines. I tried the Lokelani sparkling rosé, which is part of its deceptively named Rose Ranch line – not made from estate-grown grapes but instead sourced from “all over”, primarily from California. The wine was crisp and tasty, but the disappointment in drinking a California wine that just happened to have been blended in Hawai’i, knocked it down a bit in my esteem. 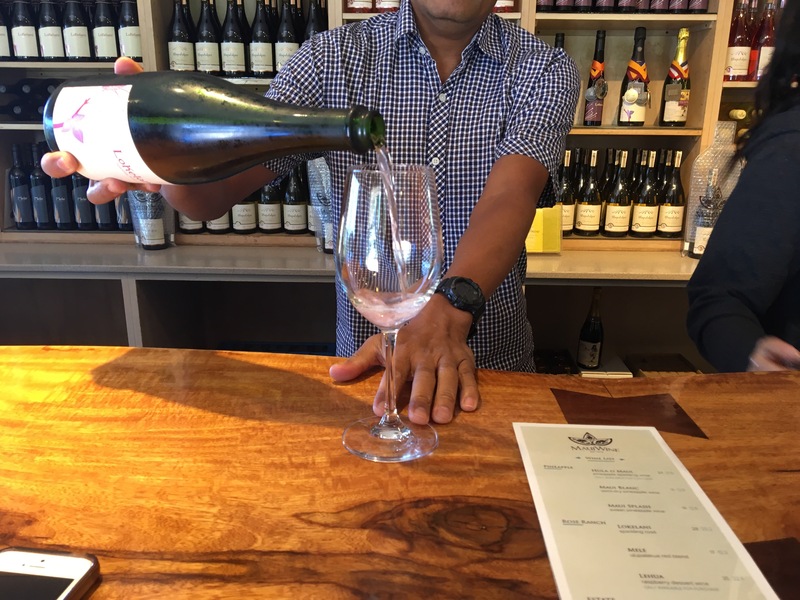 I had to try one wine made from estate grown grapes, and with Maui’s restrictive liquor laws, I had only one more to sample (note: go with a group so you can try one another’s three samples!). So I chose the Chenin blanc, which is among their most popular (but low production) wines. I’ll just say that it was a good start; it was a crisp, drinkable wine. It lacked the complexity of a Vouvray, a South African chenin, or even my favorite Chenin Blanc blend from California (Pine Ridge). 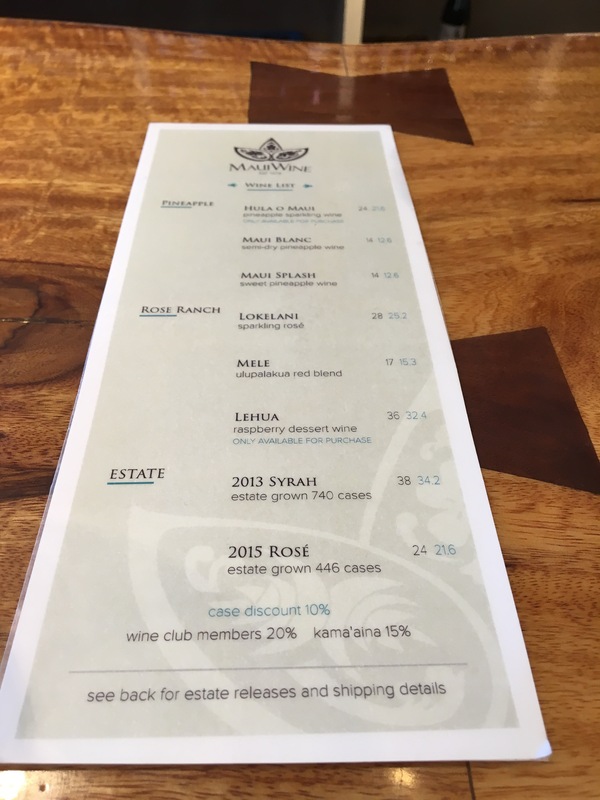 I would have loved to try all of Maui Wines’ selections. Perhaps next time! While it is off the beaten path (road), make it a stop on the Road To Hana. It’s not every day one can see amazing tropical scenery and taste delicious pineapple wines. Previous Post Explore Hawai’i and its Cuisine!